It’s no secret to any Porsche fan that Hollywood actor Steve McQueen had one big passion : motor racing. And all of us know about the iconic movie Steve McQueen made about the toughest endurance race in the world : the 24H of Le Mans. Even though the movie was filmed in 1970, it still remains the best Le Mans movie ever made. Steve McQueen played the mayor role racing the Porsche 917 in the iconic Gulf livery. Another 45 years later, the cineast Christian Giesser and Le Mans stuntman Erich Glavitza visited the shooting locations and met some of the leading characters from the former film crew. Their goal was to make a documentary about the legendary movie Le Mans. They interviewed people that were involved in the making of the movie : US film producer Peter Samuelson, Porsche racing legends Herbert Linge, Willi Kauhsen and Jürgen Barth among others. 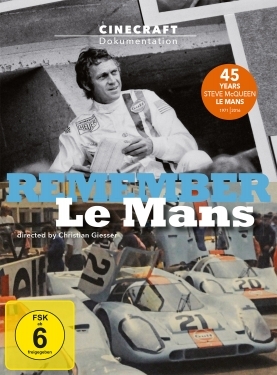 All in all, “Remember Le Mans” is an impressive insight into the making of the legendary Le Mans movie as well as an entertaining journey in time back to the wild 1970s when Steve McQueen was the highest-paid Hollywood actor and when racing drivers were still regarded as true heroes.